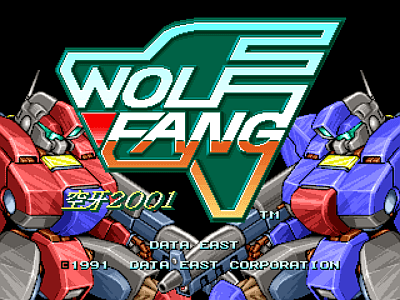 Wolf Fang - Ku-U-Ga 2001 © 1991 Data East. A good-looking horizontally scrolling shoot 'em up with a few unique features that make it stand out in the crowd. 2 players can join Team Rohga and take on the dark forces of Lagnalok in this sequel to Vapor Trail. Choose from 4 pre-built battle suits or construct your own using one of four possible parts from 3 categories - Arm, Body and Leg Unit. One of the cool powerups in this game are tiny soldiers that jump on to the hull of your battle suit and fight alongside with you. When your battle suit runs out of energy or is destroyed by the enemy, you will eject out of the cockpit and continue fighting. This game is known outside Japan as "Rohga - Armor Force". WWF - World Wrestling Federation (United States, 1952- ); became World Wrestling Entertainment in 2002 due to a lawsuit by the World Wildlife Foundation and is now currently known as WWE Inc.
DDT - a wrestling maneuver coined by Jake 'the Snake' Roberts. Many fans wonder what DDT stood for, and Jake simply replied, 'The end'. UWF - Universal Wrestling Federation (United States, 1990-1996); died with Herb Abrams in the Summer of 1996. There is also a different UWF (formally known as Tri-State Wrestling then Mid-South Wrestling), which eventually became WCW. NJP - New Japan Pro Wrestling (Japan, 1972- ), a part of the Global Professional Wrestling Alliance. IWA - International Wrestling Association (United States, 1975 (both established and disestablished)), which was owned by Eddie Einhorn, who also owned the Chicago White Sox. Not to be confused with another IWA that was established in 1994 (after this game's release). UWA - Universal Wrestling Association (Mexico, 1975-1995), also known as Lucha Libre Internaciónal. 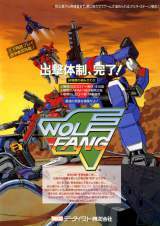 Pony Canyon / Scitron released a limited-edition soundtrack album for this game (Wolf Fang, Tumble Pop - PCCB-00084) on March 21, 1992. * Special mode (Wolf Fang only): at the title screen, after inserting a credit, hold 1P Button 1 (Shot) + 1P Button 3 (Sub Weapon) then press START. * Watch your life meter! Your battle suit will self destruct once the life meter runs out. Pick up 'life' cells to recharge your suit. When the 'charge-meter' is at full, you can take a super shot at the enemy with your sub-weapon. Pick up 'charge' cells to fully charge your sub-weapon. Hold down the fire button to change attack direction. Joystick down + Jump button will initiate a charge attack. [JP] Sony PlayStation (May. 10, 1996) "Wolf Fang: Kuhga 2001 [Model SLPS-00254]"
[JP] Sega Saturn (mar.28, 1997) "Wolf Fang: Kuhga 2001 SS [Model T-26105G]"
[JP] Sony PlayStation (dec.7, 2000) "Wolf Fang: Kuhga 2001 [Maruran Series 7] [Model SLPS-03073]"
[JP] Sony PlayStation (aug.28, 2003) "Wolf Fang: Kuhga 2001 [Major Wave Arcade Hits] [Model SLPM-87270]"
Sony PlayStation [PSOne Classics] [JP] (apr.14, 2010) "Wolf Fang: Kuhga 2001 [Major Wave Arcade Hits]"